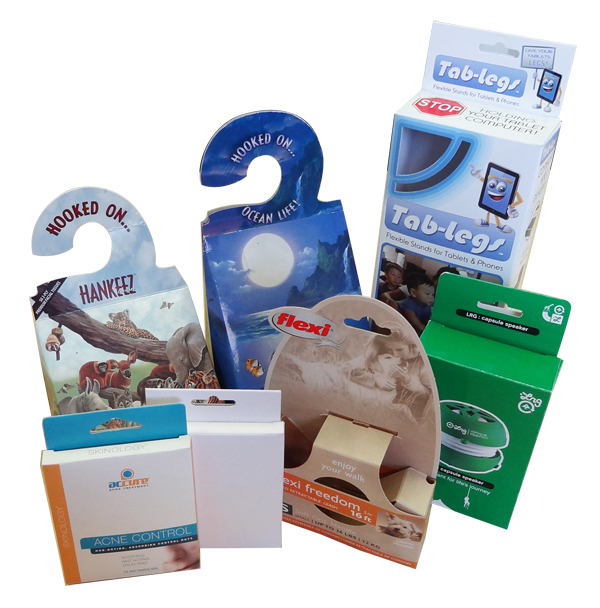 For your hanger product packaging needs Box Printing Company has just the right solution, and that solution is one of our high-quality, professional-grade custom printed hanger boxes offered right here at Box Printing Company. Custom printed hanger boxes will give your products a flexible options, either to be displayed on retailer stores by hanging on rack or sitting on counter. With Box Printing Company there are no limitations as to the shape or design of your packaging as our team is well-equipped and well-trained to make sure your custom printed packaging can match your specifications exactly. Print out any design you’d like from our selections of pre-made templates or even design your own with our team who will gladly help you make your own unique designs a reality. In addition to creating your own custom printed box choosing Box Printing Company to help you do so grants you a variety of perks that comes with Box Printing Company including free mock-ups to review before production. So take advantage of these offers and make sure your product’s packaging looks and functions the best it can. Only with Box Printing Company such amazing results at cost-friendly prices and fast turnarounds. For more information regarding any special additional features such as spot UV coating, hot stamp foiling, or embossing, feel free to contact us for more details.